Justin Wolfe case: His murder conviction was vacated three years ago. So why is he still in prison? His murder conviction was vacated three years ago, but Virginia won’t set him free. 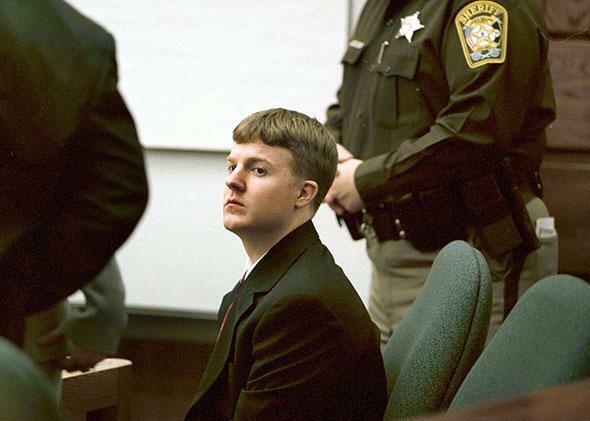 Justin Wolfe at the Prince William County Courthouse in Manassas, Virginia, on Jan. 9, 2002. Wolfe was charged with capital murder for allegedly hiring someone to kill Daniel Petrole Jr., in 2001. Prince William County prosecutors theorized that Wolfe, who was 19 at the time and sold marijuana that he purchased from Petrole, murdered his drug supplier because he owed Petrole vast amounts of money. Rather than pay up, they claimed, Wolfe arranged a hit on the drug boss, allegedly choosing Owen Barber IV as his triggerman. In addition to Barber’s testimony implicating Wolfe, the cops were able to link Wolfe, Barber, and Petrole to the drug ring via phone records. In 2002, a jury in Prince William County, Virginia, convicted Wolfe and sentenced him to death. He’s been in prison since his arrest in 2001, and on death row for most of that time. In 2005, he came within two weeks of being executed. As Drew Lindsay’s excellent 2009 Washingtonian story pointed out at the time, “courts in Virginia are the least likely in the country to reverse a capital conviction or sentence.” Nevertheless, in the summer of 2011, Raymond A. Jackson, a federal district judge in Norfolk, vacated the murder conviction and Wolfe’s death sentence. Barber’s recantation wasn’t his final word on the Petrole killing. He later recanted that recantation, then reversed course again. Ultimately, he told Judge Jackson that he had indeed lied during Wolfe’s trial, and that Wolfe had nothing to do with the murder. It was this final testimony, Jackson said, that he found most compelling. As a result of that behavior and other actions, Judge Jackson accused the prosecutors of conduct that was “not only unconstitutional in regards to due process, but abhorrent to the judicial process.” Prosecutor Paul Ebert (who has now stepped back from the case) explained that his office suppressed all of this exculpatory evidence because it “does not have an ‘open-file policy,’ providing criminal defense counsel access to entire case files.” Ebert explained that he had “found in the past when you have information that is given to certain counsel and certain defendants, they are able to fabricate a defense around what is provided.” Put another way, Ebert admitted that his office hangs on to proof of innocence in order to keep criminal defendants from proving themselves innocent. Judge Jackson’s 2011 ruling and Ebert’s statement should have ended the case for good. Instead, the commonwealth appealed. In 2012, the U.S. Court of Appeals for the 4th Circuit upheld Judge Jackson’s order vacating all of Wolfe’s convictions and sentences. The court found the conduct of the prosecution in this case “abhorrent to the judicial process.” As a result, Wolfe was released from death row on Sept. 7, 2012, though he remained locked up in Prince William County. But just four days after the 4th Circuit issued its mandate, Ebert and his assistants visited Owen Barber in prison. They told Barber that by recanting his testimony, he was now in violation of his plea agreement. Prosecutors advised Barber that if the plea agreement were revoked, he could face the death penalty again. In effect, they applied the same pressure that had been applied before Wolfe’s trial. (For their part, prosecutors say it was defense attorneys who “relentlessly badgered” Barber into proclaiming Wolfe’s innocence.) After prosecutors went back to the prison to try to pressure Barber into testifying, their star witness decided to hire a lawyer, plead the Fifth, and stop talking to anyone. Wolfe’s lawyers went back to Judge Jackson, citing this further misconduct on the part of the prosecution. In December 2012, Jackson ordered that Wolfe be released from prison. In their improper response to Barber’s changed testimony, Jackson wrote in his ruling, prosecutors had “permanently crystalized” errors they had made earlier in the case. This repeated misconduct made any possibility of a fair retrial for Wolfe impossible. But the commonwealth appealed again. And, in May 2013, the federal appeals court for the 4th Circuit found in a 2–1 decision that the lower federal court had overstepped its authority by barring a new trial. If your neck hurts from all the ping-ponging between the federal district court, the appeals court, and the state trial courts, maybe just score it this way: The prosecutors want Wolfe to be dead. Failing that, they’d like him in prison for life. Not only have Virginia prosecutors now deprived Wolfe of potential exculpatory evidence at his retrial, they are seeking to read Barber’s original (recanted) testimony to the new jurors. In effect, they will have erased the intervening years, and their own misconduct. These compounded sins of initially manipulating Barber, hiding evidence, and then allegedly threatening Barber into silence were sufficient for the federal district court to find that “the holding of a new trial would be unjust.” The appeals court disagreed. The retrial is set for nine months from now. Wolfe’s attorneys are still trying to sort out what will and will not be admitted at that trial. Paul Ebert has now formally removed himself from the case and was replaced with a special prosecutor, Ray Morrogh, who announced almost immediately upon taking the case that “Wolfe was absolutely involved in this murder and planned it and caused it to occur and he did it out of greed. … Justin Wolfe is many things but innocent is not one of them.” So we know where he stands. In a 2012 hearing, when asked by the Virginia judge what she should make of Judge Jackson’s findings, Morrough replied, “Now we’re back to square one. We’re in the commonwealth of Virginia and we’re in the state court.” As if the entirety of the federal proceedings had been a kind of glitch that could be repaired by the state judicial system. Why is the commonwealth still prosecuting a case in which the evidence is impossibly tainted, the star witness has taken the Fifth, and which the federal district court has insisted must end because the whole thing collapsed under years of repeated misconduct? Because it can. Because the commonwealth of Virginia can indict him for whatever it wants, and prosecutors seemingly face no consequences for doing so. There is nothing new about rampant prosecutorial misconduct or the widespread refusals of prosecutors to comply with their obligation to turn over exculpatory material. The prosecutorial system is built on broken incentives and until prosecutors face real consequences for manipulating evidence and witnesses, we only hear about the handful of egregious cases, like Wolfe’s, and not the misconduct that goes unreported and unsanctioned every single day. Prosecutors made it impossible for Wolfe to have a fair trial. They have pushed forward with another trial, on even more attenuated charges, because to do anything less would be to admit defeat. The paradox here is that the inability to admit error in the face of the truth is precisely what got them into this mess. And so Justin Wolfe sits in prison. It’s been 13 years.